Pioneers in the industry, we offer keytruda injection, oxaliplatin, hepatitis b vaccine injection, fulvestrant fulvidax, campto injection and ondansetron medicines from India. 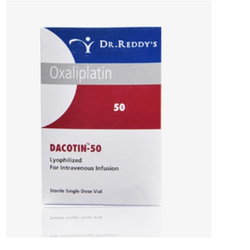 Oxaliplatin offered is available under name Dacotin-100 & Dacotin-50 and is used for anti-cancer treatment. 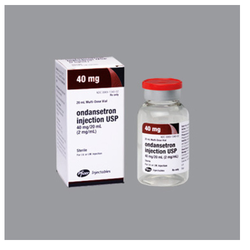 Oxaliplatin is anti-cancer chemotherapy drug and is classified as "alkylating agent"
We are counted among the leading trader, exporter, importer, distributor and supplier of high quality Hepatitis B Vaccine. Used as a birth dose, the dose given within the first week of life, provided vaccine is high on demand by the clients for their accurate composition and safe consumption. 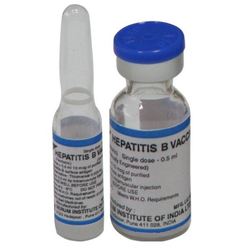 The offered vaccine is processed utilizing quality tested chemical compounds and advanced technology at vendors’ end in line with industry norms. Furthermore, this vaccine is available for the clients at market leading prices. 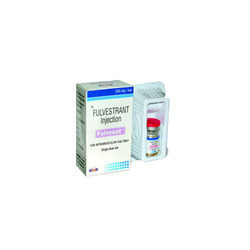 Fulvestrant Fulvidax uses generic names in all descriptions of drugs. 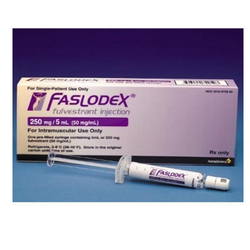 Faslodex is the trade name for fulvestrant. In some cases, health care professionals may use the trade name faslodex when referring to the generic drug name fulvestrant. 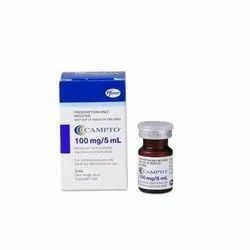 CAMPTO in combination with cetuximab is indicated for the treatment of patients with epidermal growth factor receptor (EGFR)-expressing, KRAS wild-type metastatic colorectal cancer, who had not received prior treatment for metastatic disease or after failure of irinotecan-including cytotoxic therapy. IV Dose : 32mg IV or 150 mcg per kg of body weight. Children : 150 mcg per kg body weight (6 months to 18 years). IV Dose : 4 mg IV over a period of thirty sec. to five min. (Given just before anesthesia). Children (1 month to 12 years) : 100mcg/kg of weight for children weighing 40 kg or less, or 4 mg for children weighing over 40 kg. 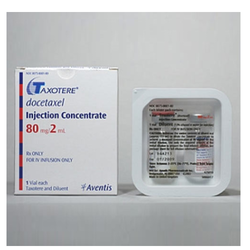 We are an eminent entity, engaged in offering a superior quality Taxotere Injection. Used to treat breast cancer, ovarian cancer, some types of lung cancer, head and neck cancer and prostate cancer, offered drug is precisely processed using high grade chemical compounds and contemporary technology at vendors’ end in sync with industry standards. A team of our quality experts check this drug on different parameters of quality so as to ensure their flawlessness. 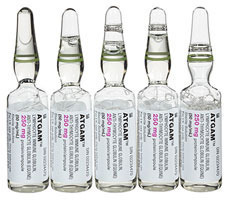 Besides, clients can avail this drug from us at nominal prices. 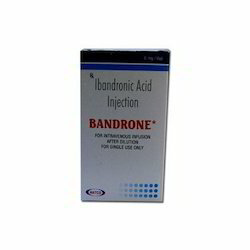 Our valued clients can avail from us optimum quality Bandrone Vial Injection. It is used for the treatment and prevention of osteoporosis in postmenopausal women. This injection is formulated using best quality chemical compounds and highly developed technology in synchronization with set industry norms. For the satisfaction of clients, we offer this injection as per their given specifications. 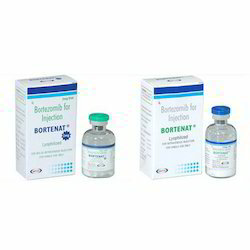 Our offered injection is extensively valued among the clients for its long shelf life and highly effective. 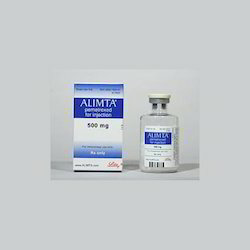 Alimta Injection offered is available in 500mg packaging and is offered under the brand name Alimta. 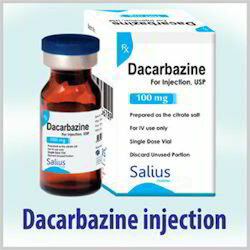 Dacarbazine Injection offered comprises Dacarbazine for injection USP and is available in 100 mg packaging. 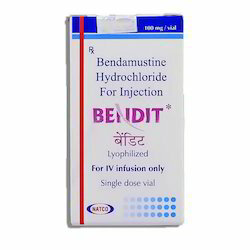 Levering on our vast industrial experience, we trade, export, import, distribute and supply an optimum quality Bendit Injection. Used for treating chronic lymphocytic leukemia, offered drug is procured from the certified vendors’ of the market in sync with industry norms. 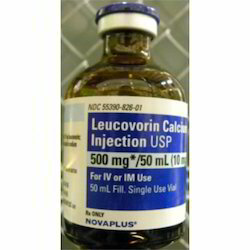 Backed by our years of industry experience, we are betrothed in presenting an excellent quality of Leucovorin Calcium Injection. This injection is given to the patients suffering from giant RBC anemia. The injection deprived from salt available in white color. The offered injection is clinically approved by the health agencies. There are no side effects or damages cause to the patients taking the provided injection. Though, the recommendation has to be provided by a practitioner. Besides, the injection can be made available by us at industry leading rates. 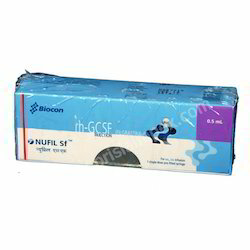 With an aim to fulfill varied requirements of our valued clients, we are engaged in offering Nufil Safe Injection. This injection is offered to the patients suffering from skin and liver issues. At our end, this injection is prepared using quality salts and methodology. Further, we keep a track record of the medicine’s reviews and performances provided to us by the clients. The injection can be availed at the nominal prices through drop shipping services. 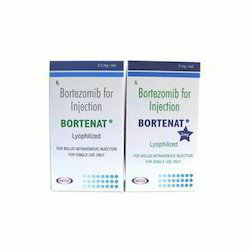 Bortenat Injection offered contains Bortezomib for injection and is available under brand name Bortenat. Ixempra (ixabepilone) is used to treat advanced breast cancer. 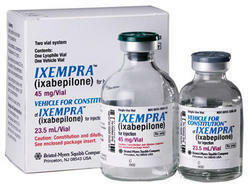 Ixempra is usually given after other cancer medications have been tried without successful treatment. Ixempra may also be used for purposes not listed in this medication guide. 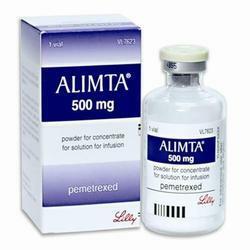 ALIMTA Pemetrexed for Injection : Pemetrexed (brand name Alimta) is a chemotherapy drug manufactured and marketed by Eli Lilly and Company. 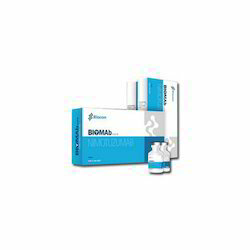 Its indications are the treatment of pleural mesothelioma and non-small cell lung cancer. Backed by a team of highly skilled professionals, we are involved in exporting, wholesaling and supplying a qualitative range of Gemnat Injection. This injection is used for the treatment of acute CMV colitis in HIV/AIDS and CMV pneumonitis in immunosuppressed patients. 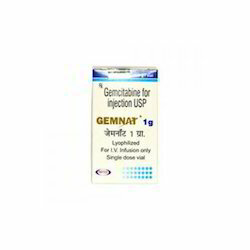 The offered range of Gemnat Injection is free from any kinds of impurities. 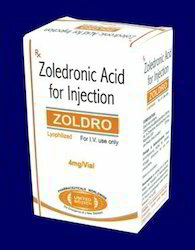 Available in various packaging options, this injection is highly demanded among clients all across the globe. Biomab Injection offered comprises humanized monoclonal antibody and is used as cancer treatment option. To retain our goodwill as the competent trader, exporter, we are offering quality assured Fulvenat Injection. By utilizing superior quality chemical compound and innovative technology, the offered injectable is precisely processed under the guidance of vendors’ professionals. We offer this injectable in different packaging options as per the demands of our clients. 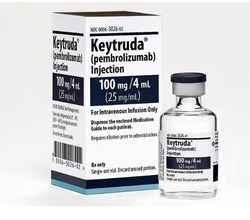 Used when the cancer no longer responds to anti-estrogen medicines like tamoxifen, clients can this injectable from us at market leading prices. pirssm is the preferred choice of our customers for offering hygienically formulated Reditux injection. 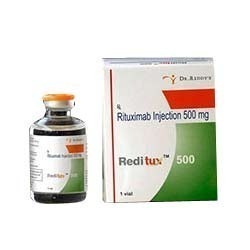 Reditux is an anti-CD20 antibody used for the treatment of leukemia, rheumatoid arthritis, and lymphomas. 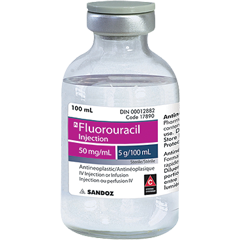 Prepared in compliance with the FDA standards and norms, this injection exhibits a longer shelf life and accurate composition. Acute leukemia, HIV related kaposis sarcoma. Alopoecia and dermatological reactions. Extravasation of daunorubicin may cause severe local tissue necrosis damaging surrounding muscles, tendons and nerves. IV infusion, back pain, flushing and chest tightness. Bone marrow suppression, cardiac toxicity, cardiomyopathy and congestive heart failure. Increased risk of hepatic toxicity when used with hepatotoxic drugs e.g. high-dose methotrexate. Increased risk of cardiotoxicity when used with cyclophosphamide. Immunisation with live vaccines is not recommended. Concurrent radiation may lead to increased radiation reaction. 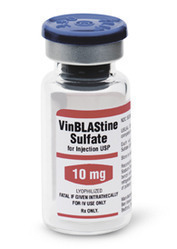 Vinblastine sulphate is a cytotoxic drug that arrests cell growth at the metaphase. Its actions are more pronounced on the rapidly dividing cell than on the normal cell. It appears to act, like vincristine, by binding to the microtubular proteins of the mitotic spindle, preventing polymerisation.